Tomorrow (or later today, for some of us), Hall of Fire returns to The Hobbit as we delve into the events of Chapter 12 — “Inside Information”. 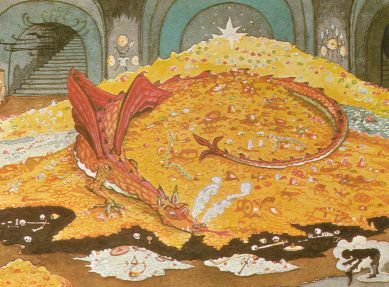 The party has found a way into the mountain, yet one insuperable obstacle remains — Smaug. Yet the seem dwarves reluctanct to approach, leaving Bilbo to do all the work. What does it say about Thorin’s character that he pushes Bilbo to go into the darkness alone? And what does say about Balin that he chooses to accomany Bilbo part of the way when the others find it beyond them? “Going on from there was the bravest thing he ever did.” What do you think passed through Bilbo’s mind, standing there all alone, in a dark tunnel with Smaug ahead? How is his subsequent riddling session different from his one with Gollum? How do you think he fares considering the doubts Smaug raises about his companions motives? Are those doubts justified, or is it just Smaug’s spell? And just what all does this chapter tell us about Dragons? Join us this Saturday (July 11) at 6pm EDT in #thehalloffire on irc.theonering.net when we’ll discuss these questions and many others as we look at Chapter 12 of ‘The Hobbit’ — Inside Information.